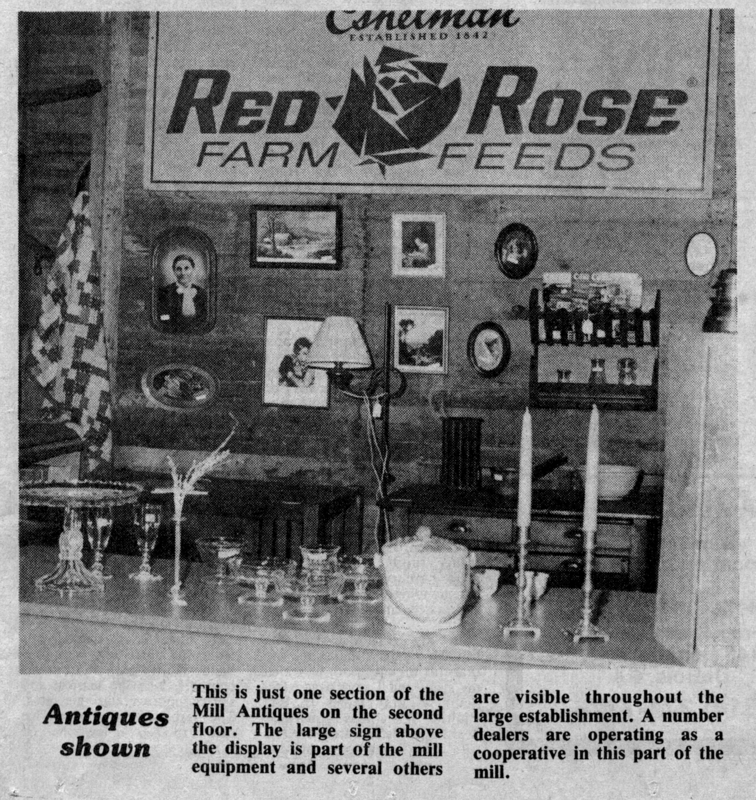 Renee Gendreau writing for the New Castle News in 11/7/1989 says: The area around the Mill, located on the banks of the Allegheny River, is also starting to regenerate. A bed and breakfast has located behind the Mill and houses and stores in the neighborhood are sprucing up and repainting. 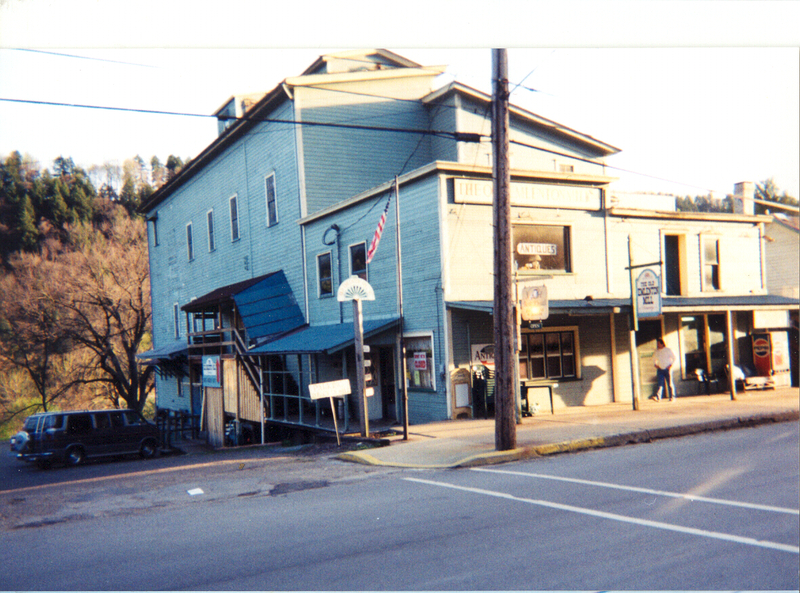 “We’re still looking for a sit down restaurant and an outfitters” Mrs Stump said of the area that “people have said it looks like a little Christmas village.” Built in 1875 the mill was powered by gas heated steam and was operated by Terwilliger since 1947. Terwilliger shipped grain all over the world until operations ceased in 1974. 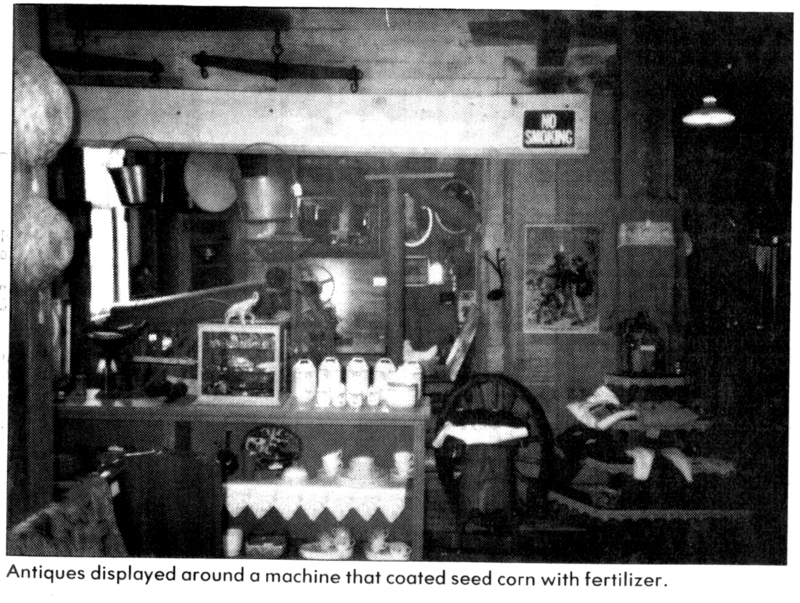 In the 19th century, millers were called masters and looked upon as leaders in their communities with knowledge in areas as diverse as engineering and food storage. 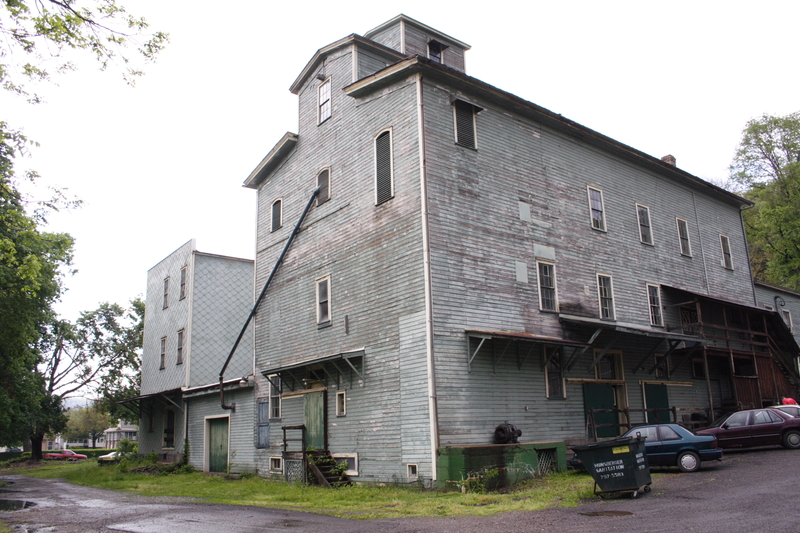 Mills, where people had to go for their grain, lumber and cloth, were gathering places for news, commerce or even romance. 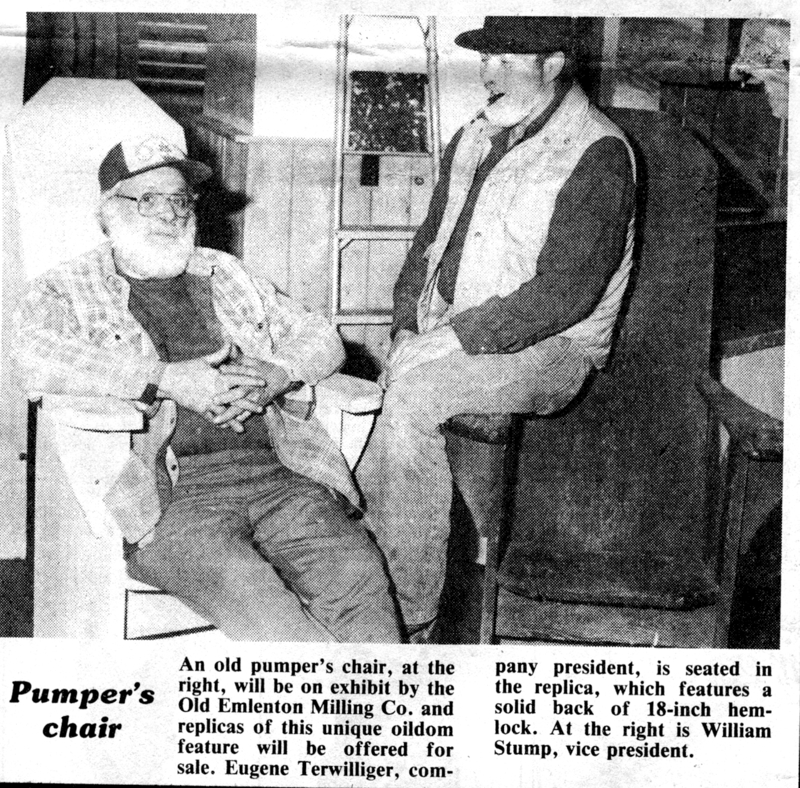 Renee Gendreau writing for the New Castle News in 11/7/1989 says: It was when Terwilliger began to realize that he may have to give up the Mill because of high upkeep cost that Mrs. Stump jumped in. A former English teacher at Youngstown State University. 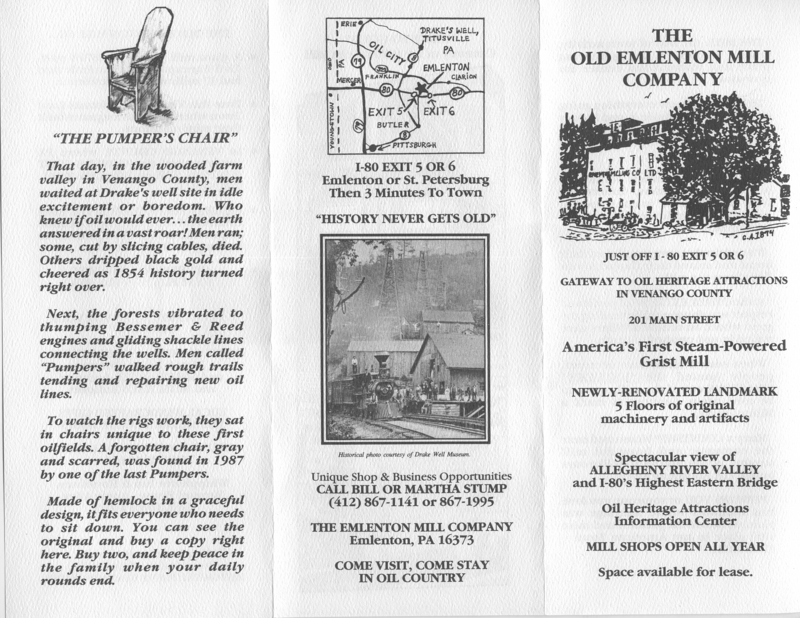 Mrs. Stump had researched the history of the Mill and thought it would be a great place for tours or offices. Somehow, though the office idea got lost along the wayside and Stump and Terwilliger , along with other stockholders, decided to turn the Mill into a co-operative with hand crafters leasing space to sell their wares. 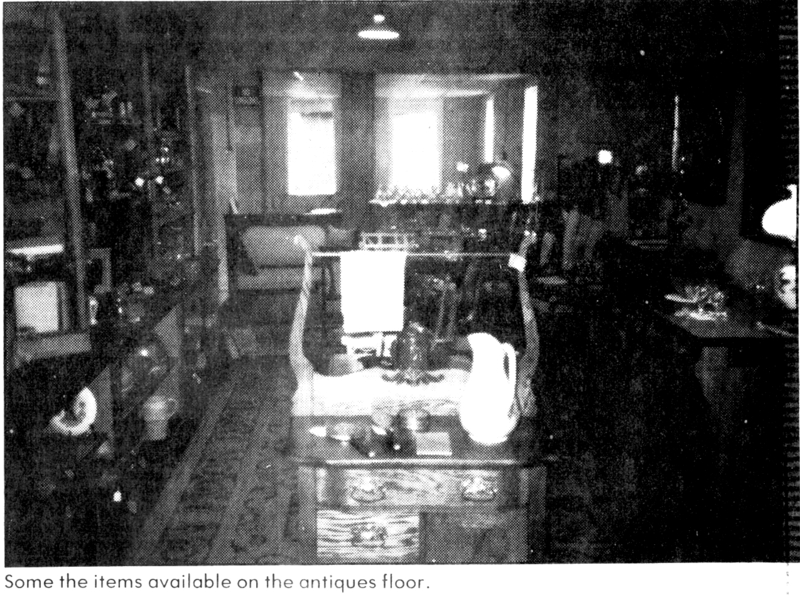 Currently ten people lease space on the Mill’s first floor with the second floor being dedicated to antiques. Those involved in the co-op are required to work three days out of every 27 days. 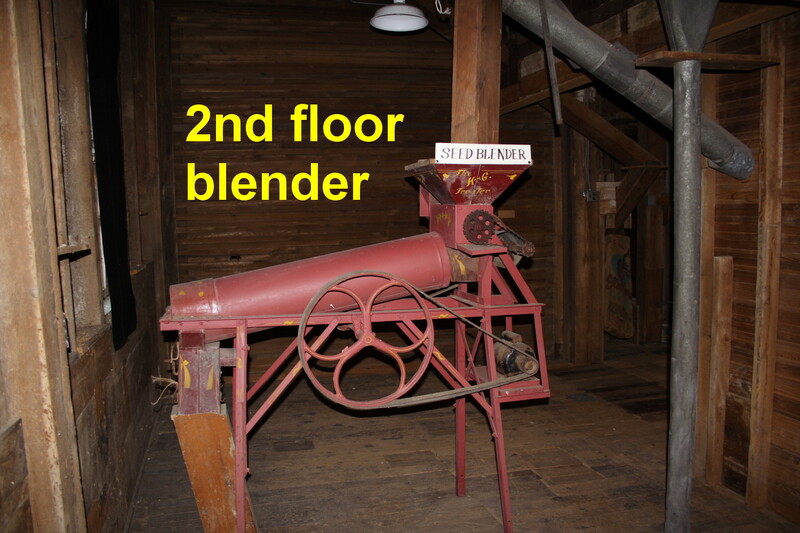 The owners also give historical tours of the Mill, explaining to visitors the significance of each of the original pieces of machinery in the Mill. 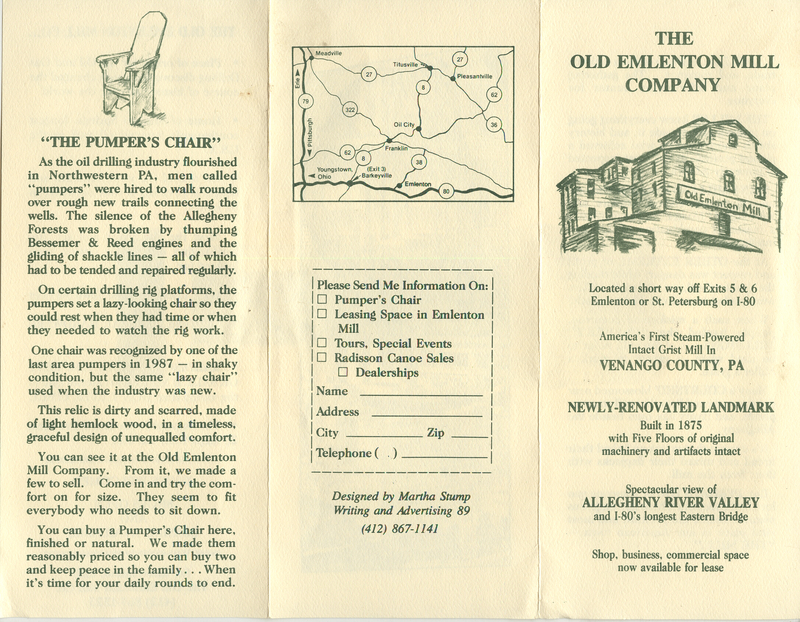 Renee Gendreau writing for the New Castle News in 11/7/1989 says: In the Summer of 1988, Bill Stump and Eugene “Twig” Terwilliger were the proud owners of a grist mill in Emlenton filled with such things as 200 gallons of rotted molasses with rats embalmed in it, pigeons, moldy grain, cobwebs and chickens. 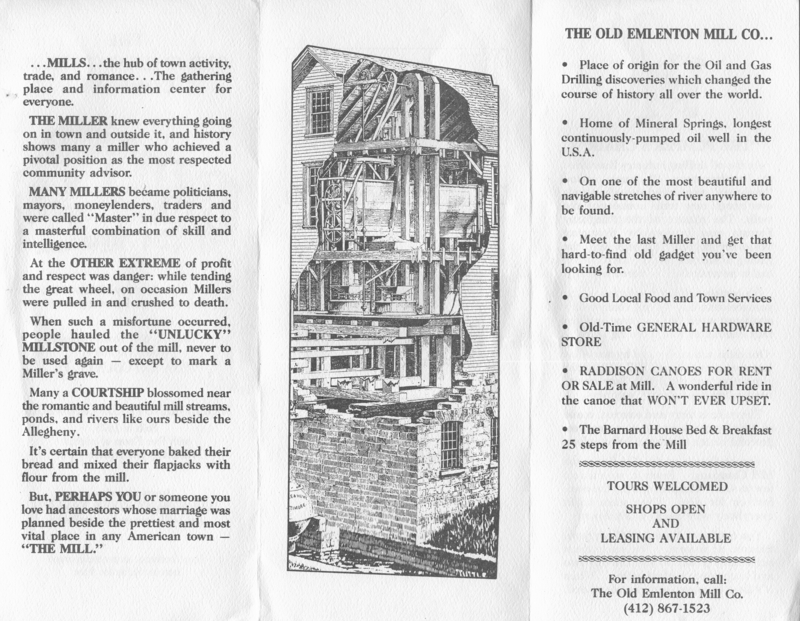 This summer, the Old Emlenton Mill Co. opened as a five story history book of shops featuring everything from hand painted replicas of the Mill and Victorian band boxes filled with candles, soaps and coffee to Radison canoes and small wooden furniture. 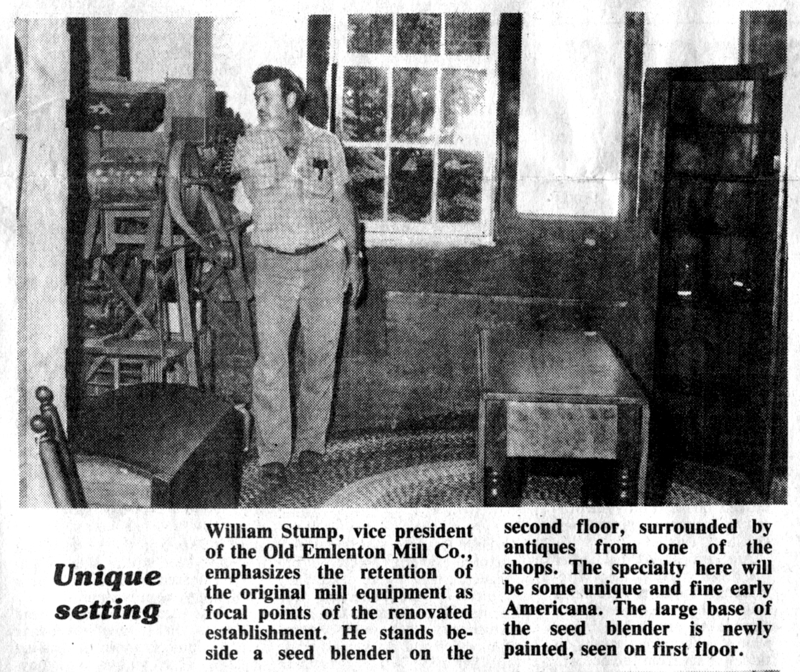 “Bill’s still cleaning the place” said Martha Stump, Bill’s wife who helps with the “fun stuff” – public relations, tours and renting spaces. “The Mill’s like a hungry baby”. 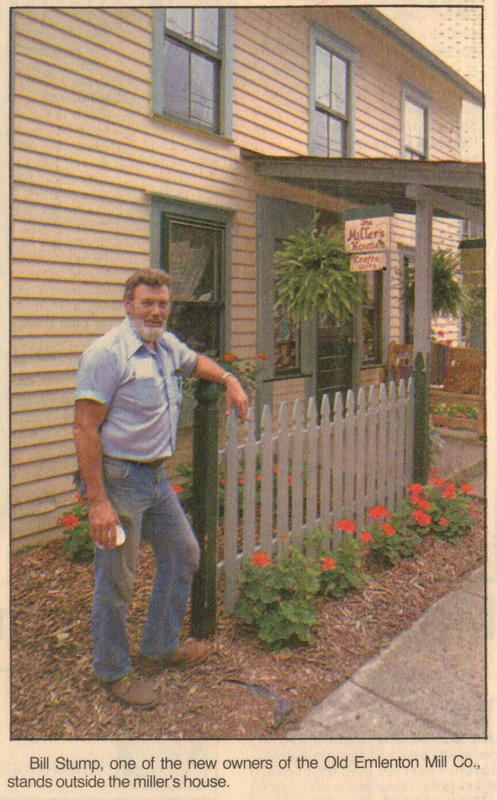 Terwilliger, Venango county’s last miller, met Stump, who also runs Calibration Services in Edinburg, as a customer of Twig’s Old Time Hardware Store, located next to the Mill. Lawrence Sanata writing for the Herald 8/25/1989 says: Eugene Terwilliger, “Twig”, had contemplated tearing down the towering Mill because of problems securing and paying insurance on the structure. 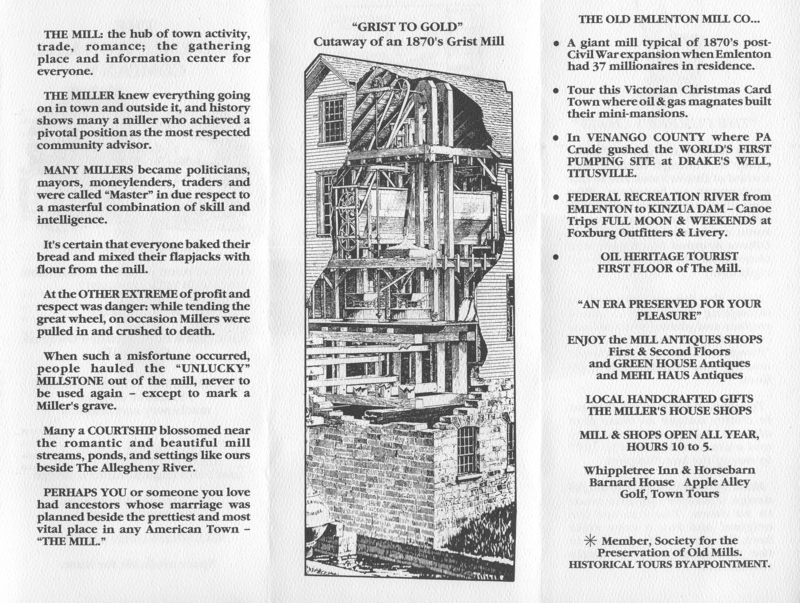 (I’ve heard he had an Amish crew lined up to do the job) Terwilliger was the last in a long line of “millers”, the name given to Mill operators. 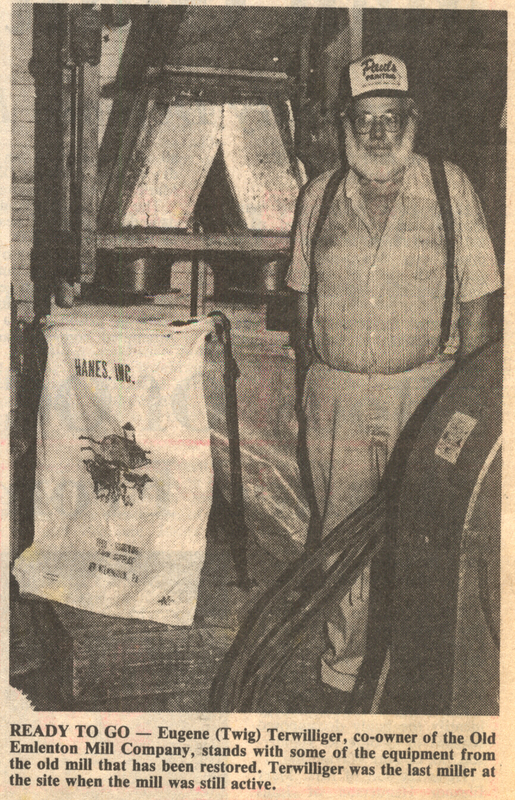 He operated the Mill from 1947 to 1974. At one time, millers were the most influential members of the community, overseeing the most important industry in some towns. If not one of the most influential, he remains one of the most colorful. 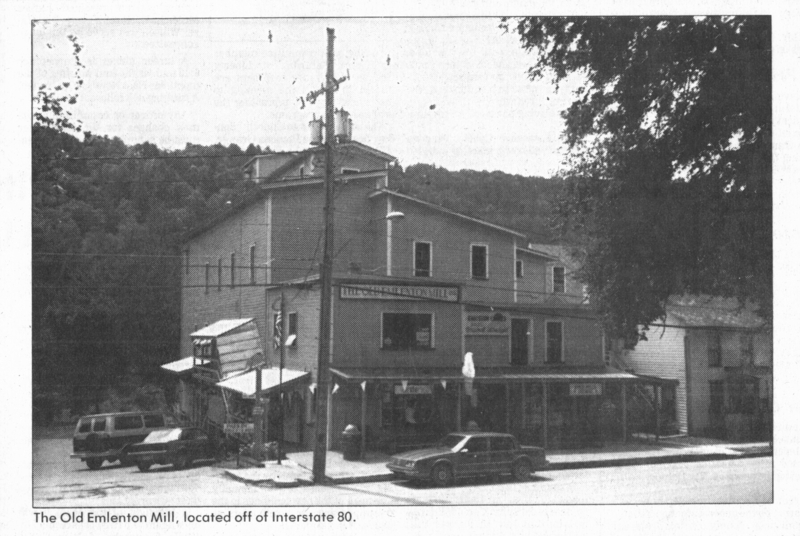 Troubled about the possibility of the Mill being torn down, Bill Stump, another long time Emlenton resident and businessman, teamed up with Twig. Together, they and some others transformed the old business into a new venture.